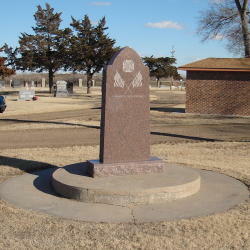 Description: A granite monument is enclosed in a brick walled courtyard. American Flags (48 stars) are engraved on the upper part of the monument. Below the flags is an inscription reading: "For Our ~ Country ~Dedicated ~ May 30th, 1926". 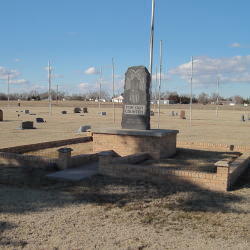 A small bronze American Legion plaque is mounted at the base of the flagpole. Description: A Veterans of Foreign War symbol is engraved above crossed 48 star flags. The inscription below the flags reads: "In Memory Of Those Who Gave".